Dumfries is the Region's largest town and the real gateway to Galloway. The town is the administrative, commercial and shopping centre for a large hinterland. Voted the best place to live in Britain in 1997, many of the older properties are built from Locharbriggs sandstone - a handsome, local red rock. Many of the main visitor attractions are linked with Robert Burns as he lived in the town from 1791, until his death in 1796. Ellisland Farm near Dumfries is a popular visitor Attraction. The Scottish national poet Robert Burns lived at Ellisland Farm near Dumfries, where he wrote many of his best nature poems and songs. Visit the Ellisland Farm website to find out more. Avoid the A75 and take the back roads. Just minutes away from Dumfries is New Abbey offering a cluster of places of interest. Sweetheart Abbey is a roofless edifice looming over the village with worn stonework glowing red. Coming out of New Abbey, take the coast road to view the typical Solway scene of moors above and sea below and all around lush green. Sandyhills is a reminder that the sands and low cliffs have for long been enjoyed as a resort area. 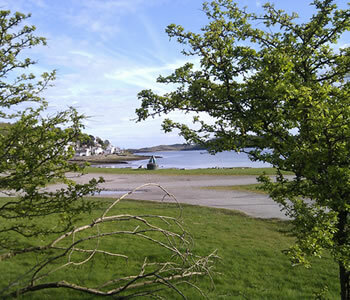 Stroll from Rockcliffe with it's well kept gardens and a path through scrub and open coastal woodlands to Kippford (pictured) where neat bungalows doze gently in retirement mode amongst the "Riviera" views. On the Way to Kirkcudbright stop at Balcarry Point to digress and do some bird watching. Kirkcudbright is a cheerful multi-coloured town with a tidal waterfront and an artistic reputation with it's Harbour Gallery, Broughton House and the Stewartry Museum. Keeping on the back roads will take you through the peaceful pastel painted town of Gatehouse-of-Fleet, past the Gem Rock museum of Creetown and onto Newton Stewart - a substantial town with a local museum and a natural route centre with touring options at every compass point. Past Wigtown a colourful community with a wide main street, museums and tales of 17th Century Religious Fanaticism. Here you are in the 'Machars' - the rural lolling lands of the South - open land with wide breezy skys. Heavy soils made from glacial material dumped and shaped into little whalebacks (drumlins) during the last ice-age. Also a well known area for prehistoric and Christian Sites. To view the most well known head Whithorn, one of the first places in Scotland to practice Christianity. Here is the Whithorn Dig - a major programme of excavation with a visitor centre. Travel south of Whithorn to the Isle of Whithorn (still on the mainland, don't let the name fool you) where you will find peace amongst the boats and the waves. In Dunragit, near Stranraer, you can visit Glenwhan Gardens. This is a unique plantsman's 12 acre garden open daily to the public from April to October. It has a licenced tearoom and plant centre. The attractive Glenluce Abbey and the South Westerlies benefit gardens like the Logan Botanic Garden (pictured) where the prevailing mildness is appreciated by a multitude of exotic species. Continue South to reach the Southernmost tip of Scotland at the Mull of Galloway - a winding road across a rocky neck of land collared with wave beaten cliffs and a lot of sea between you and the Isle of Man. 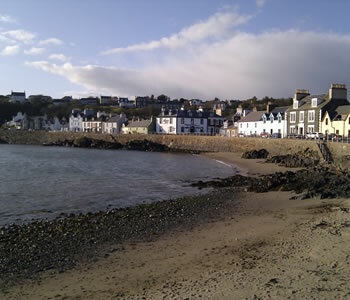 Also on this coast is the lovely colourful fishing village, Portpatrick (pictured) - the official starting point of the Southern Upland Way, 212 miles of footpath to Cockburnspath in the East. Continue to Stranraer the ferry port town imbued with a faintly end of the line windswept air. Of Newton Stewart is Loch trool - high hills, tops shorn bare, crags green and purple flanked and birdtrees ringing with birdsong. The area also has a historical association - Bruce's Stone a boulder recording Robert the Bruce's first victory over occupying English forces in 1307 and the start of the Bannockburn Campaign. The Merrick - the highest hill in Southern Scotland lies to the North of Loch Trool. As you head back towards Dumfries stop at New Galloway at the top of scenic Loch Ken and at Castle Douglas, a pleasant town with many home bakeries and butchers shops.Threave Gardens is nearby with a wide range of rock, water and shrub features.